About a year or so ago I decided to chronicle my outfits but I have been so lazy taking pictures and uploading them. I will try to see if I can do it again.Anyways we took the kids to the park yesterday and I was rocking my lovely DIY ankara earrings . I asked hubby to take a few pics for me et Voila !!! 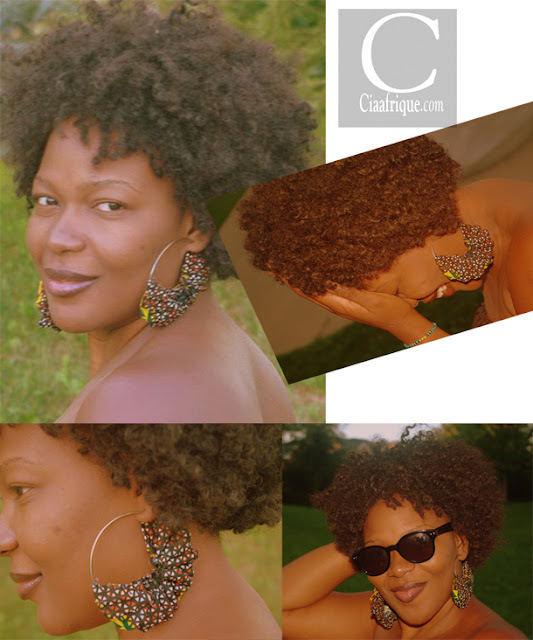 .I made these a while back and it was made with some left over fabric and my $1 beauty supply earrings. I hope you like it !!!!! aaaah! I love the earrings, is there a tutorial somewhere??? Love your hair, too! Gorgeous Lady! @ebony I made these earrings before i started the DIY section on the blog . But I will try to do one soon . love, Love, LOVE...they remind us of our stuff - www.facebook.com/tribaljewellery - Great minds think alike...we should collab! Your earrings are beautiful. You said you were going to do a tutorial....do you have a link for the tutorial?